How has Phoenix Real Estate started in 2013? The Phoenix area real estate market was good to home owners in 2012. It was the first year of appreciation since 2005. Buyers frequently found themselves frustrated by the competion for homes especially those under $200K where there is an abundance of first time home buyers and investor demand. After a robust year in 2012, how is 2013 shaping up? What has changed since a year ago? As part of the healing process in the real estate market, the number of short sales and foreclosures continue to decrease. The graph to the left shows the percentage of sales of short sales /pre-foreclosures and lender owned/foreclosures by city. Compared to a year ago, there has been significant improvement. If you were to look at the same graph from a year ago, each city has experienced a reduction in distressed sales. For example, Gilbert went from 45% distressed sales to 21%! Glendale saw a change from 54% to 31%. Mesa went from 46% to 29%. Chandler saw distress sales fall from 51% to 28%. Scottsdale fell from 25% to 12%. 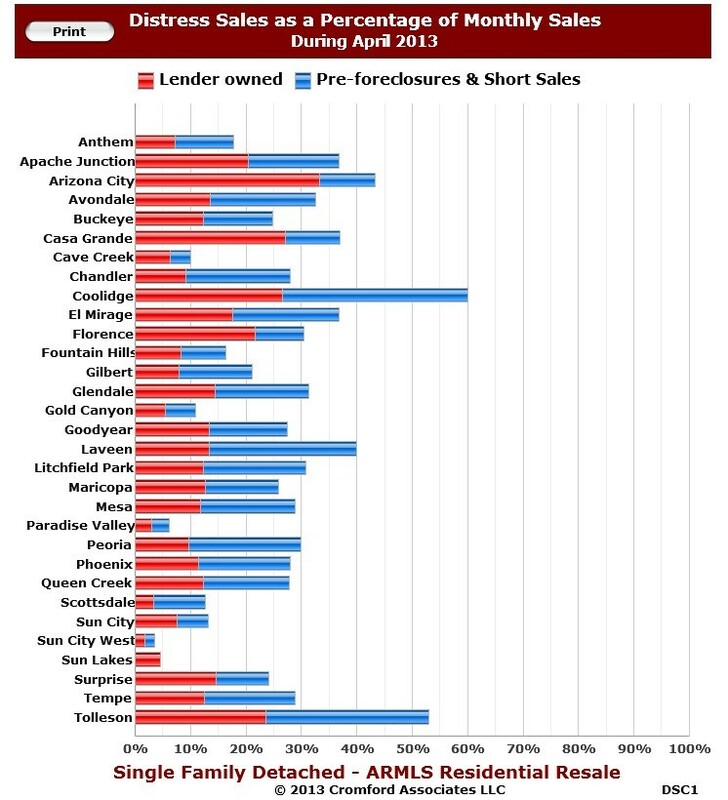 Every city in the Phoenix area saw a decrease in short sale and lender owned properties. To appreciate where we are, you only need to look back to 2011 when the distressed sales were over 60% of total sales in most Phoenix area cities. The reduction in distressed properties, especially lender owned/foreclosures/REO properties can be demonstrated in the active listings over time. 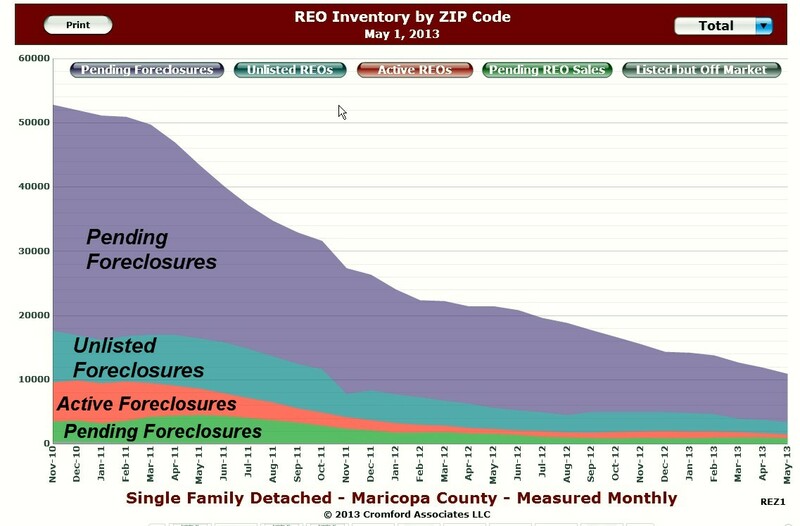 To the right is a graph for the last 2.5 years of foreclosure inventory in varying stages for the Phoenix area. Pending foreclosures represent properties that have received a notice of trustee sale which may become foreclosures, short sales, or remedied through loan modifications. The reduction has been significant. When you look at Unlisted Foreclosures, please repeat – No Shadow Inventory!. Arizona is a non-judicial foreclosure state, but that is another blog. The combination of record low interest rates and buyer awareness that prices are rebounding has created a real estate demand that cannot be satisfied by the current supply. The result is low inventory and multiple offers on many properties as they come on the market. One way to compare supply and demand is to measure the supply in terms of months of supply. Most cities are experiencing low months of inventory supply similar to the graph to the left for Gilbert, a popular east valley city. 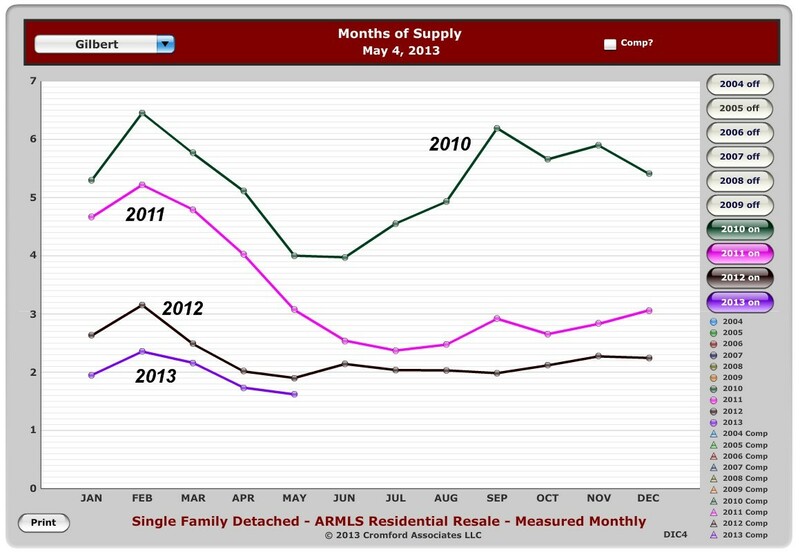 The months of supply for Gilbert has not been this low since 2005. If you would like to receive listings of homes for sale in any city, go to Send Active Listings. What does this mean for prices? 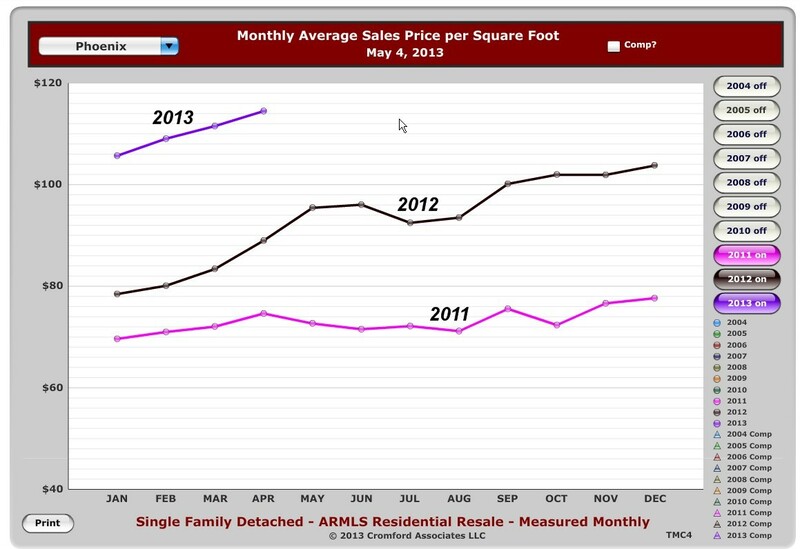 Low inventory and strong demand translates into rising prices. To the right is a graph for over the last 2 years for the city of Phoenix which contains a diverse cross section of real estate. The appreciation that took hold in 2012 has continued in 2013. Real estate price appreciation can vary between cities and even between neighborhoods. If you would like to know the average sales price/sq.ft. trend for your city, please e-mail me your city and I’ll forward it to you. If you would like to know the value of your home, click on What’s the Value of My Home. What will the rest of 2013 bring? One long running favorable trend is the decrease in distressed sales which appears will continue for the rest of the year. And everyone has benefited from low interest rates. These historically low rates have motivated buyers to lock in lower mortgage payments compared to years past. At the beginning of the year, I estimated that real estate would appreciate 8 – 12%. Right now I believe that we’ll end up at the higher end of that range. Your thoughts? Don't settle for a home built in the 90's!! This Beautiful 3 bedroom/2.5 bathroom home is in a great location and walking distance to Safeway shopping Center, Shumway Elementary School and Provinces Park. The upstairs features a master bedroom, 2 additional bedrooms with great closet space and loft. In addition, there is a separate laundry room and hallway with storage cabinets, new carpet and paint.The lower floor is complete with tile flooring and entertainment center prewired for surround sound.Includes washer/dryer and refrigerator. Great home, great location and best of all GREAT PRICE! Schedule your showing today. This almost 2,000 sqft home has 3 Bedrooms + Den. But the ''JEWEL'' of this home is the 16'X36' DIVING POOL. Good friends and good times will be enjoyed in this backyard oasis for years to come. A rich mixture of Cool deck and Brick Pavers create a wonderful blend of color mixed in with your green, green grass area. Duck under the covered patio for those hot July days, and enjoy a refreshing dip in the pool with a surprise cannon ball off the deep end. What fun you will have. The interior of this well-kept home is immaculate amidst the newly painted neutral wall colors. And check out the wood-like flooring just installed in the den. NEW AC in 2018. You will love the comfortable flow of space between the formal Living Room - Recently updated Kitchen - and Family Room. A MUST to see. 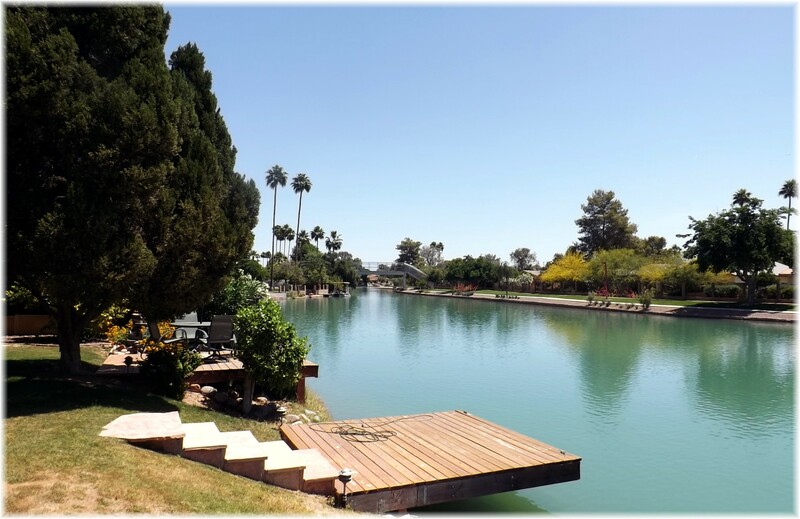 You will absolutely love this authentic property now available in delightful Gilbert. Professionally landscaped with beautiful grassy front landscaping and stone accents on the facade. Take a look at this impeccable interior complete with 4 bed, 2 bath, living/dining area, den great for an office, and neutral color palette throughout the entire house. Well maintained kitchen features sparkling stainless steel appliances, large island with sink and breakfast bar, honey oak cabinetry, pantry, and recessed lighting. Inside this double-door master suite you will find picture windows, lavish full bath with dual sinks, separate tub, step-in shower, and walk-in closet. Gorgeous grassy backyard with covered patio is ideal for entertaining. Live your best life in a great home & neighborhood now! Want to be close to everything, while having plenty of room for all of your cars, boats, & RVs--without an HOA? This is the home for you! All of the bedrooms are huge--1 even has its own private balcony! Brand new flooring & paint in modern colors throughout! The master bedroom is light & bright with vaulted ceilings, a bathroom with large vanity area, a walk-in shower, & a walk-in closet. Lots of windows throughout making the home full of natural light. The backyard has a sparking HEATED pool & large grassy area shaded by a mature tree & storage shed. 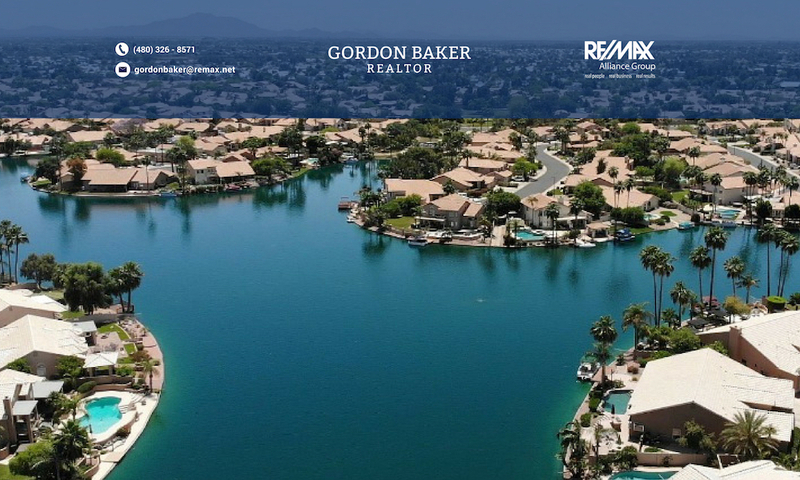 Relax floating in the pool with a drink in your hand, the warm Arizona sun on your skin, & the smell of food grilling on the bbq! Home has been well cared for with only 2 owners! The location & price of this home are unbeatable, so don't wait! Single story Spanish/Mediterranean custom home. 5 bdrm/4bath, great room, dining room, media room. Private entry courtyard w/gas fireplace, beautiful rod iron glass front door. Great room w/gas fireplace and built-in media niche. Wet bar. Large gourmet kitchen with Viking appliances, alder cabinets, and granite countertops. Large nook with built-in buffet. Travertine flooring and carpet, wood shutters and custom drapes T/O. Back patio w/fireplace. Pool.